Having lived with this inflammatory and controversial story for 25 years, and hearing and seeing the story told over and over again by others who are not aware of the facts surrounding my family's experience at Ruby Ridge, I find it important to share some of those very facts with you below. Thank you for visiting my website. I deeply appreciate the prayers, the support, and the encouragement that I have received from so many of you over the years. Please scroll down to see Sara's most recent Interview for the 25 year Anniversary. My name is Sara Weaver. 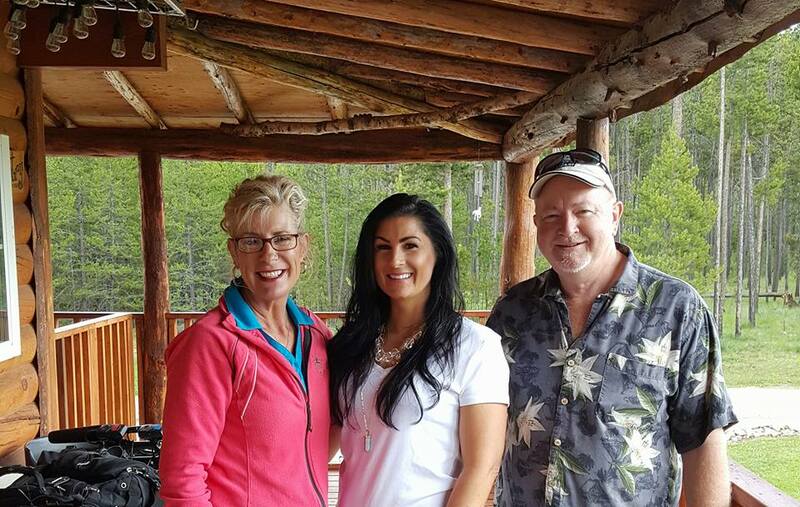 I am a survivor of The 1992 Federal Siege at Ruby Ridge® and the oldest daughter of Randy Weaver. For many years I struggled with grief and depression, burdened by the deaths of my mom and little brother. I am sharing my story, because I have been forgiven by the saving power of my Lord and Savior, Jesus Christ. I now have the freedom to forgive those that took the lives of my mom and my little brother when I was just sixteen. My heart is to share with you, how that is possible. My prayer, is that you would be blessed by my story and find God's incredible healing and love, in your own life. Editor’s note: This interview was conducted March 30, 2017, at Sara’s home near Kalispell, Mont. This August marks the 25th anniversary of the standoff and federal siege at Ruby Ridge that rocked northern Idaho, spread repercussions across the nation, and deeply impacted a 16-year-old girl and the rest of her family. Sara Weaver, now 41, the oldest child of Randy and Vicki Weaver, remembers the events leading up to the siege, those 11 turbulent days that left three people dead, and how she has hurt and healed the past 25 years. Sara and her father co-wrote and self-published a book in 1998, “The Federal Siege at Ruby Ridge: In Our Own Words.” Sara also wrote a self-published book of poetry and journal entries in 2009, “Dawn Over Ruby Ridge,” and her autobiography in 2012, “Ruby Ridge to Freedom: The Sara Weaver Story.” Randy does not give interviews, but following are Sara’s memories from the siege 25 years ago, and the details of how she rebuilt her life and came to forgive the federal agents blamed in the deaths of her mother and brother. My earliest memories of childhood are wrapped in the comfort of an ideal American family, rooted in rich black soil of the mid-west. My grandparents owned and operated a small farm in Iowa, cultivating corn and soybeans and raising cattle and hogs. We would travel the two-plus hours from our home in Cedar Falls to "Grandpa's farm" in Fort Dodge. This was where my mother Vicki grew up; a world of tall corn, green fields, red barns, juicy tomatoes and smelly obnoxious hogs. It was where I and my little brother Sam would promptly climb the cherry tree with our many cousins and stuff ourselves silly on sour pie cherries. From there we would head to the barn and, despite Grandpa's warnings get scratched by the wild kitties we just knew we could tame.....My memories are fond of that farm--intricate and colorful, in blocks, like one of my mother's hand sewn quilts." "I blinked and waited. I was sure there would be shots fired that would kill the rest of us. We started down the steps from the back porch, and still I waited. Unbelievably, I heard nothing. We began to walk away from the cabin. The cabin had been my home since I was just a child. All of my happy memories were forever obscured by a huge black cloud of sorrow and pain that would doggedly follow me forever." "It has been indescribable to live my life in the light and grace of God's love and peace. I now understand that He has a perfect plan for my life and He is the reason I am free. He is the only reason I am still here, the reason I did not die at Ruby Ridge. He has a plan and all I have to to do is choose to trust Him, one day at a time. I want to make clear that I have not "arrived." I am still a work in progress and I praise Him for His patience with me. I still have hard days, but the difference now is that I know I am not alone in them. I know He is taking care of me. I know those hard days are growing me and molding me into who He wants me to be. More often than not, the hard things I experience and choose to give to Him and learn from, are for the benefit of helping someone else who is struggling. That is the greatest gift of all--to know that the pain and struggles we experience can be for a greater purpose and, in essence, know that what we have been through was not in vain, not for nothing. This takes care of the echoing questions of "why?" in our lives. There may not always be a perfect explanation, and for many things, we may only completely understand when we reach heaven and all is ultimately revealed." When I sent a copy of the document stating the March 20, 1991 court date to the media, they confronted the U.S. Marshals' office in Boise. us get through this whole mess. I guess you could say we were looking for a miracle." "I met Frank K. in 1984. Frank was a bit on the goofy side, always talking about ways to get even with the government. In retrospect, I wondered many times if he wasn't a snitch. It was Frank who talked me into attending my first Aryan Nation World Congress near Hayden Lake, Idaho in '86. He suggest we go down and ' see what it's all about.' At the time I was not aware of the magnitude of the governments efforts to infiltrate right wing organizations. I already knew that I didn't agree with the Supremacist philosophy held by the Aryan Nation members, but I was curious and I am always interested in learning more about religious beliefs. Frank and I drove down to hear what they had to say. a few from Europe and some from Canada. I talked to a number of people there who also did not agree with the Aryan Nation racial views. They, like me, enjoyed sharing common beliefs and learning about different view points. I only listened to a couple of the scheduled speakers in their church before I realized I didn't want to hear any more tirades against non-whites. I was much more comfortable outside at the picnic tables mingling with the crowds. I can understand hating someone because they hurt you or your family, but to hate someone just because they are of another race, is sheer ignorance." ​For each book sold, $1.00 will be directly donated to the Sparrow's Nest of Northwest Montana to help unaccompanied homeless high school students. 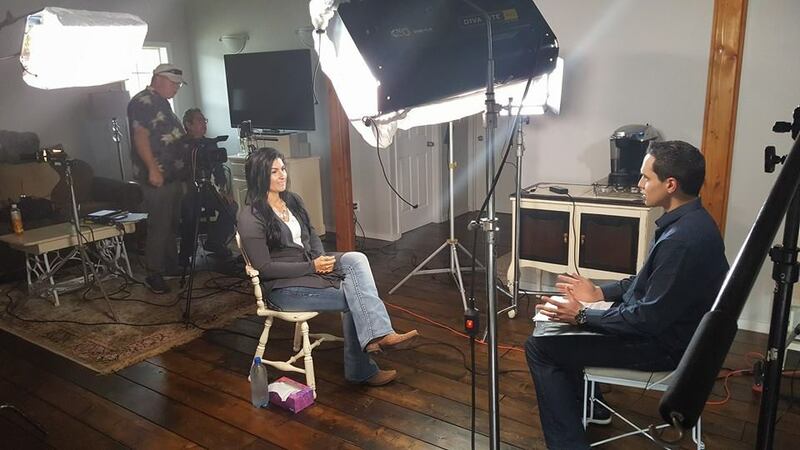 SARA'S INTERVIEW WITH CRIME WATCH DAILY AIRED ON NATIONAL TELEVISION JUNE 1ST 2016. SEE THE SHOW ABOVE. 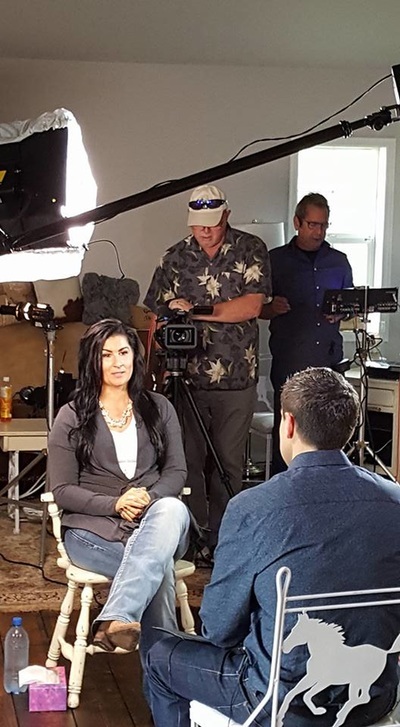 PICTURES OF SARA WITH SOME OF THE FILM PRODUCTION CREW FOR CRIME WATCH DAILY BELOW.